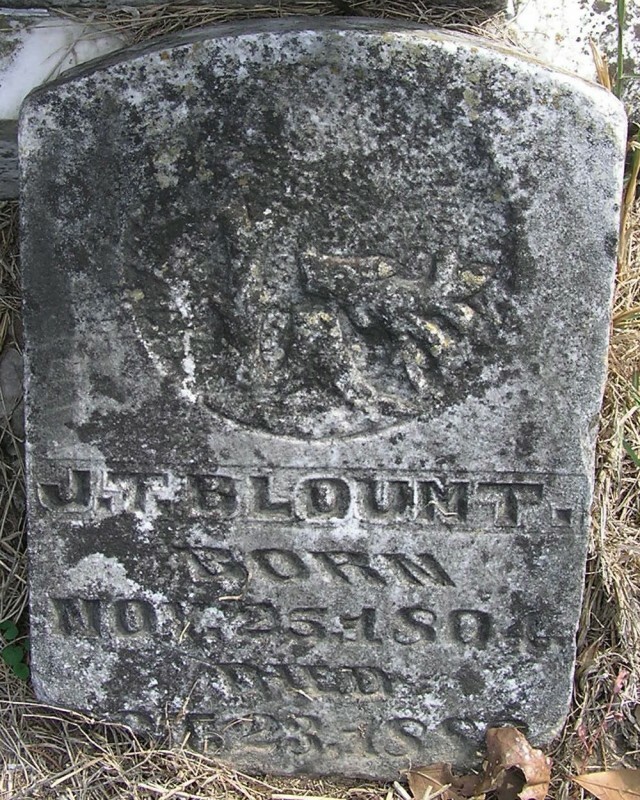 JOHN THOMAS BLOUNT was born 25 Nov 1804 in North Carolina, and died 25 Oct 1883 in Bedias, Grimes County, Texas. He was the son of FREDERICK BLOUNT and MIORUM “Mary” KOEN. He married CLARISY CLARISSA ANN CARTWRIGHT Abt. 1826 in Montgomery County, Alabama, daughter of THOMAS PETER CARTWRIGHT and ELIZABETH SHAW. She was born 10 Aug 1810 in Alabama, and died 25 Nov 1883 in Bedias, Grimes County, Texas. William Peter BLOUNT b. 20 Nov 1827, Washington County, Alabama; d. 24 Dec 1907, Neshoba County, Mississippi. JOHN CARTWRIGHT BLOUNT b. 15 Sep 1829, Washington County, Alabama; d. 10 Apr 1910, Neshoba County, Mississippi. JAMES KOEN BLOUNT b. 04 Oct 1832, Washington County, Alabama; d. 27 Apr 1918, Brady, McCulloch County, TX. JOSEPH SHAW BLOUNT b. 1835, Washington County, Alabama; d. Bef. 1883, Texas. ALEXANDER LUTHA BLOUNT b. 28 Mar 1837, Mississippi; d. 11 Sep 1884, Madison County, TX. FRANCIS MARION BLOUNT b. Abt. 1839, Mississippi; d. Bef. 1880, Texas. MARY JANE BLOUNT b. 27 Mar 1839, Plattsburg, Neshoba County, Mississippi; d. 1883, Texas. AMANDA F. BLOUNT b. 27 Dec 1843, Lee County, MS; d. 11 Dec 1929, Beeville, Bee County, Texas. ELIZABETH BLOUNT b. Abt. 1846, Mississippi; d. Bef. 1880, Texas. MARTHA ANN BLOUNT b. 1847, Mississippi; d. Bef. 1850, Mississippi. VIRGINIA ADELINE BLOUNT b. 20 Nov 1848, Mississippi; d. 20 Dec 1921, Grimes County, TX. JULIA ANN BLOUNT b. Oct 1854, Mississippi d. 1926, Madison County, TX. CLARINDA TEXAS BLOUNT b. 11 Mar 1856, Mississippi; d. 03 Feb 1895, Madison County, TX.